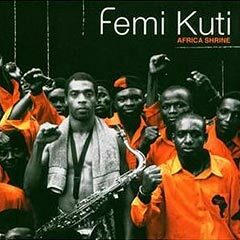 Femi Kuti's new CD album Africa Shrine is released in early October 2004, and accompanied by a European tour. An exceptional 90 minute live / documentary captured on DVD illustrates this unique experience. It was recorded live in Lagos at the mythical Africa Shrine, where Femi Kuti performs every Sunday, denouncing the abuses of corrupt government and one-way globalisation. Through the singular music of afrobeat, Fela Kuti, and then Femi after him, have developed a unique awareness within both the politicians and the citizens of Nigeria. Produced by Raphaël Frydman (Babylone's Fever / Manu Chao), this documentary combines live recording and documentary scenes of Femi Kuti, the Shrine and the atmosphere in Lagos. From the heart of the resulting social and political chaos, the voice of Fela Kuti echoed as a hope of justice. His fate wavered between personal persecutions and collective triumphs in the name of his people and his country. We cannot resume the importance of the 'Black President' in a few lines. Auteur of dozens of albums which have become classics, poet of the dignity of a people and critic of corrupt powers, Fela Kuti remains the most celebrated icon of African music of the 20th Century. First female Union leader in Nigeria, his mother, a tireless militant, would strike fear into corrupt politicians and fight for independence and women's right to vote. She instilled in him the duty to fight for his people. Fela Kuti passed this heritage on to his own children in turn. Concert hall at night, social drop-in centre in the daytime, living space, a place for political instruction, the Shrine remains a theatre where awareness is mixed with forgetting, words are put to music. The original shrine in Pebble Street is no more, it's been converted into one of the evangelical churches Fela Kuti criticised throughout his lifetime. On a newly constructed stage, beneath portraits of panAfricanist poets and heroes of Black Power, tonight Africa is witnessing the renaissance of afrobeat. The new Africa Shrine is rising up, to prove that like the Yoruba proverb, the son of a tiger remains a tiger. The Nigerian federation, which has just reinstated a civilian government after sixteen terrible years of military dictatorship, has found its new resonance (and reasoning) chamber, a new temple, where an altar is dedicated to the man who carried death in his quiver. Femi Kuti's Africa Shrine is bigger, more open. A portion of the 13 million inhabitants of Lagos throw themselves body and soul into the Sunday night Sunday Jumps', nights of aural ecstasy where they can forget their distress. Three and a half years after its inauguration, the Africa Shrine has become the emblem of a city as fascinating as it is Dantean, valiantly struggling to pull itself from the economic quagmire overshadowing the future of the most populous country of Sub-Saharan Africa. Despite the setbacks caused by all those who reject his outspoken views - fundamentalist preachers, corrupt politicians, xenophobic militia, delinquent Ogas - and despite the economic pressure inherent in running such a venue, the Africa Shrine is as well known as its predecessor. Although Fela Kuti's famous queens are still dancing in the cages of the Shrine, the sellers of NNG (Nigerian Natural Grass) are more discreet. However, in this new Shrine, Lagos is burning as bright as ever, and Femi Kuti's concerts simmer with an energy which lacks nothing of his father's performances. At the end of March, whilst the UWe and MK2 crews were finally setting up their cameras and microphones to record the Femi Kuti's first live CD-DVD album, the country was preparing the election, in a climate combining chaos and apathy, of the 774 local governments of the federation of 36 states and 250 ethnic groups. The year before, during the country's first post-independance civil electoral transition, the outgoing president Olusegun Obasanjo was voted back in during elections marred by irregularities and marked by political assassinations. The north of the country, essentially Muslim, barricaded itself into a suicidal Sharia criminal code, instrumentalised by former barons of the military dictatorship. The south-west, in turmoil after the increasingly worrying addresses delivered by certain evangelical churches, found itself caught up in a rat-race, caught in a stranglehold with the fall of the national currency, the Naira, and the deregulation and privatization of the remaining public services which remained in existence. As for the petrol-rich south-east, it became a grey zone out of bounds to foreign journalists, patrolled by ethnic militia and private security companies employed by the energy multinationals. A sign of the times: a few days after the visit of the UWe / MK2 Music team, its producers Arnaud Frisch and Charles Gillibert, the sound engineer Sodi, and the director Raphaël Frydman, a mysterious coup d'etat was crushed in its infancy in Abuja, the new federal capital. 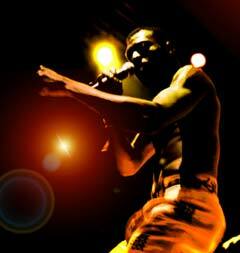 Capturing the most authentic concerts of afrobeat, bearing witness to the full strength of Femi on his own ground, in front of his public. At the origins of "Africa Shrine - Live at the Shrine" is first and foremost music which is Femi Kuti's "raison de vivre". "He keeps his trumpet with him even in his tub", says one of his closest choir members. When Femi Kuti plays to the extreme like this, his African Jazz-Funk seems to possess an inexhaustible, fascinating energy. And just seeing the energy issuing from Femi and his group, as well as the communion of his audience, we can understand why, from the Afro-House stage of New York to the Rap scene of Chicago, from the Afro-beat nights of London to the minimal techno of Cologne, so many people of the west dream of going some day to Lagos and get involved in one of those mythical Sunday Jumps. With music, interviews and street scenes, this live CD remains, above all, the portrait of a man and a people who are fighting. For if Femi Kuti himself confesses that this project of live recording is the one he cherishes most fondly, it is undoubtedly because it reflects best his reality: that of the Shrine, that of Lagos, that of the Nigerian people. For this recording, Femi Kuti has carefully selected some of the brightest stars of Afro-beat, an offering for an entranced crowd. Selected only, for in the temple of Shrine, only the people decide. Femi Kuti unanimously chose some titles and rejected others, to keep only what enthralls him. Besides the classic "97" and a revival of Fela's famous "Water No Get Enemy", the CD features only new titles out of the Shrine cradle for the first time. After three years' work, Femi Kuti finally presents them through this fabulous recording and the accompanying world tour. If he was to explain it to a newcomer, Sodi, the sound engineer of this outstanding venture, would speak of "Afro-urban" sounds: "First of all because it is very electric and then because it also refers to the Yoruba rhythms as demonstrated by the drums. It is the African tradition, enhanced by electricity and brass". This ancestral funk, boosted by adrenalin, supports the popular revolt of Femi Kuti. Titles such as "Dem Bobo" or "1, 2, 3, 4" still blast institutional "democrazy", whilst the insurgent "Shotan" seems to start a regular trench war in the venue. Such a subtle balance between revolt and sensuality creates the charisma of Femi Kuti, as square as his shoulders, and as open and generous as the heart of Africa. The Shrine may well be dead, but the Africa Shrine is well and truly alive. It's undoubtedly to be reckoned with as one of the finest visiting cards of this 21st century Africa, in full disagreement with the obituaries of the western media. Prepare to hear and better understand the calls of the most populous country in Africa.